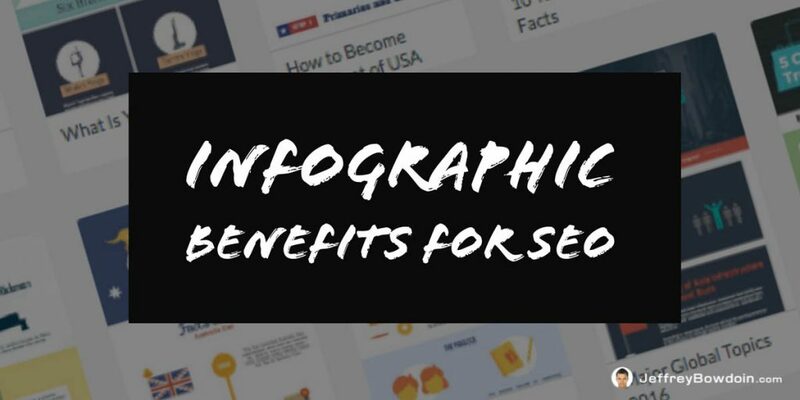 There are many benefits of infographics for your SEO strategy. Infographics can be an excellent way to present content or data in a visual form. They not only provide great user experience for your audience, but they are also highly shareable. Though infographics have exploded in popularity in recent years, some call it a fad . However, I don’t think infographics will ever completely go away. I think Infographics are here to stay, but new forms of infographics will gain in popularity. For example, Motion Graphics (animated graphics), and other more interactive forms of infographics are rising in popularity. The following are some benefits you may get when creating infographics as part of your SEO strategy. Using Infographics can be a great white hat SEO method for building backlinks. When people share your infographics, you can earn some organic backlinks. Diversify your link building strategy: However, you should not use this method solely to get backlinks. It should be approached more as a way to get exposure for all your other great content. You never want to overdo it with any single method of earning backlinks, due to the risk of it looking unnatural. Links = Popularity: Backlinks are one way that Google knows which websites and pages are more ‘popular.’ It makes sense that Google tends to rank a site with more backlinks. Logically, if a lot of people are linking to you, more often than not, you must be offering something of value. Getting a lot of organic backlinks goes a long way in climbing to the top of the search engine results. This will especially be the case if you pair your infographic with search engine friendly content. Create a text blog post to go with it: You can create an infographic, and post a text-heavy blog post to go with it. Since Google cannot understand what the infographic is about, you’ll want to supplement it with yummy content that the search engine spiders will gobble up. This way Google will index your content, and you will have a highly shareable asset to go with it to attract links. Backlinks, along with high-quality content are two of the best ways to prove yourself to Google’s search algorithm. SEO is such a broad discipline. Almost every online marketing aspect is involved with SEO some way or another. Everything from Branding to your social media strategy – these all contribute to your SEO strategy. Almost every type of marketing (social media, content marketing, blogging, etc) has either a direct or indirect affect on your SEO, search engine rankings, and traffic. Another significant advantage of creating infographics is it can increase your brand awareness. If your infographic is widespread through the various social media networks, it can help grow your brand awareness. Add your logo and website: As people keep seeing your awesome infographics, your brand will start to stand out. You will naturally want to put your logo and website on each infographic so people will start to recognize your brand. Brand awareness on autopilot: Let’s say you create a beautiful infographic about top healthy foods and pin it on Pinterest. If you place your logo on it, your branding, etc., you can get quite a bit of brand awareness without much work (assuming it is well received and get a lot of re-pins). Since people love infographics, people are likely to repin your infographics. If it is an evergreen topic, you may get re-pins over and over again, indefinitely. This semi-automatic nature of pins and social media will continue to push your brand awareness. People will be able to see it in their friend’s feeds, through searching by keywords, etc. If you produce high-quality content, such as infographics, it benefits your company’s image. The image of your business or blog is important. How people perceive your business has a direct impact on whether they will recommend it to other people, continue purchasing products from you, re-visit your blog, etc. Infographics can also contribute to customer loyalty. The infographic-Loyalty link may seem like a stretch. However, customer loyalty is a byproduct of things like branding and relationship marketing. If high-quality content like great blog posts and infographics help your branding efforts, you are sure to benefit from increased customer loyalty as well. Infographics are share-worthy: All the above explains why infographics are so great for the user experience on the web. People love to share infographics, and this in turn increases your social media following. Hiring somebody to create infographics for your business or blog can get pretty pricey. If you are artistically inclined and know how to use Photoshop or Adobe Illustrator, you can also create infographics yourself. However creating them from scratch and take a long time to finish. I’m all about finding tools that improve my efficiency as a marketer so I can have more time in the day to do other things. There are many free infographic tools online that you can use to quickly and easily create infographics. The following infographic is one that I made on one of these free websites. Obviously it’s not the best infographic you’ve ever seen. However it only took me a few minutes. I could create a much better infographic using illustrator but it’s going take me a lot more time. If time or budget is a factor, creating a quick infographic through a template system is better than nothing. With all these benefits of infographics, why aren’t more people doing them? Well, many are. Though the use of infographics may seem a little saturated, they can still offer high ROI to your business and SEO efforts. With all the easy to use infographic makers, you have no excuse not to start making infographics!